Join us to spend a beautiful evening with La Marina company, which will help you discover the wonderful tradition of French cuisine while admiring the beautiful City of Light. Visit our agency, which is located in the heart of Paris, opposite the Louvre Museum, to board one of our cars, which leave at 6:15 p.m.
You will be brought to the Quai de Solférino to board a La Marina boat-restaurant. Our team will welcome you and seat you at your private table. You will then depart on a 1 hour 15 minute cruise that offers you a magic view over Paris, its bridges that cross the Seine, and the most symbolic monuments that border the Seine. 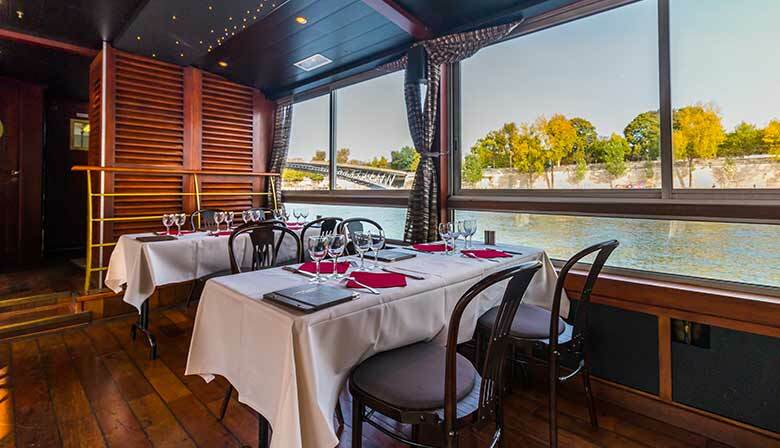 During your boat ride, you will enjoy a relaxing dinner of traditional fine French cuisine. In this warm setting, you will enjoy the panorama while you savor your delicious meal. At the end of the wonderful dinner cruise, you return to shore to join our motor coach, which will bring you either to our agency or the Place de l'Opéra, as you choose. The boat was very clean, the service was friendly and the food was good. However, it took longer than I expected to load the boat. As a result, the dinner cruise felt "rushed". Some people had reservations following the dinner cruise for another tour (like Eiffel Tower), so timing was critical. I would recommend to Paris City Vision that they allow an additional 15-20 minutes up front for boarding so that the cruise is more enjoyable. I did appreciate the drop-off in the Opera district since our hotel was located there.